What companies would you hold up as examples of succession planning done right? Not to avoid your question. Certainly, many examples of outstanding succession planning exist, such as Johnson & Johnson, Goldman Sachs Group, Inc., Microsoft Corp. and Caterpillar Inc. Indeed, research shows that well over 50% of companies typically promote their CEOs from within. Such companies obviously understand one of the most fundamental tenets of business: A well-crafted succession plan vastly minimizes disruption when any CEO leaves, expectedly or not. At the extreme, imagine what it felt like inside Citigroup and Merrill Lynch in the weeks after their CEOs departed. People all over the company were asking themselves, “What will happen to me in this mess?" and “What will the devil-we-don’t-know be like?" So long, productivity! In-house succession has the added virtue of being cheaper, as an outside hire almost always requires enough money to fill an armoured car. But if good succession planning makes so much sense, why isn't it more common? Well, sometimes a board must go outside to shake things up. IBM Corp. turned to Lou Gerstner, then at Nabisco (National Biscuit Co.), for instance, when it wanted to transform its culture in 1993. More recently, the German company Siemens AG hired Peter Loescher from Merck & Co., Inc. to separate itself from long-standing practices that had damaged its image. In still other cases, a company can have a controlling shareholder who wants to do succession his way. Viacom Inc.’s Sumner Redstone and Fidelity’s Ned Johnson come to mind. But when a change effort or a controlling shareholder is not the case, and succession planning still doesn’t happen, the fault can only lie with the board. Sure, boards have other big responsibilities, such as grappling with the CEO over growth opportunities and strategy. But we would suggest two other reasons why succession planning can fall off a board’s agenda. The first we have written about before: So-called “shareholder activists" have lately pressured boards into a bunker mentality, in which?they?obsess?over the minutiae of financial reports. We say so-called because no real shareholders would ever want their boards to fixate on rounding errors rather than growth and succession. Obviously, we’re not saying that boards should ignore financials, but no board member, flying in once a month to pour over reams of data, is ever going to uncover a scheme. That’s why the board’s job, when it comes to financial oversight, is to make sure management has the control systems and high-integrity people in place that will. The second reason is more emotional, in that the topic can be, well, awkward.After all, succession planning requires boards to talk candidly about what qualities are missing in the current CEO and the timing of his or her departure, and it compels the current CEO to chime in on these matters without seeming defensive. The whole thing is like a married couple trying to have a conversation about who the perfect “replacement spouse" would be. Pretty squirm-worthy stuff. Now, we’ve heard it said that boards don’t have good succession plans because senior management ranks are so thin in today’s “perform or die" cultures. We would spin that argument to say that if senior management ranks are thin, it is because so few companies are thinking about succession and thus asking their people to take on cross-functional assignments. They allow them to rise to the top of their silos and then retire. This dynamic is particularly prevalent in financial institutions, where there is virtually no crossover among trading and retail and investment banking because of “expertise demands" and compensation differentials. The one notable exception is JPMorgan Chase & Co. CEO Jamie Dimon, who basically acted as Sandy Weill’s junior partner for 16 years, building expansive business experience and knowledge along the way. Alas, Jamie Dimon cannot run everything! Nor can financial company boards keep scrambling to find someone like him when their CEO walks away. Succession planning has got to be deliberate. It has to be a discipline. And if boards don’t impose that on themselves, perhaps authentic shareholder activists will, soon. Jack and Suzy are eager to hear about your career dilemmas and challenges at work, and look forward to answering some of your questions in future columns. 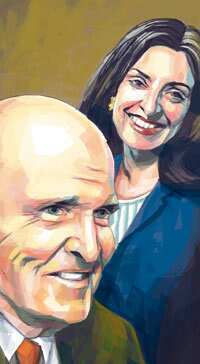 Jack and Suzy Welch are the authors of the international best-seller,Winning. Campaign readers can email them questions at winning @livemint.com. Please include your name, occupation and city. Only select questions will be answered.